Any recommendations for a relatively simple hit and miss engine project ? 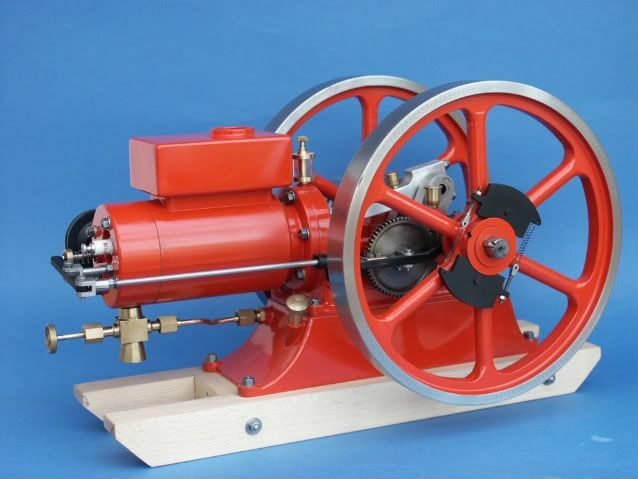 With one of my vertical engines nearing completion I've been pondering what to make next, I have a few small projects to be getting on with such as a small Southworth pump but as for an engine I'm a bit undecided where to go next. My main field of interest is steam and I'm hoping to start building a biggish steam engine starting in the spring of next year but to fill in a few months I've been thinking more and more about a hit and miss engine. Over the last year or so there seems to have been quite a lot of interesting postings in the forum show various hit and miss engines been built and I can now see the appeal. Can anyone recommend something reasonably straightforward that relative beginner might be able to build? I'm not bothered too much whether it's casting or barstock but I can't cut gears and I'd like something that isn't going to rely on any specialist tooling. Re: Any recommendations for a relatively simple hit and miss engine project ? I don't know if Graham has any sets of RLE castings left but that is quite a straight foward one to make. There are two good examples that come to mind. Do a web search for a design from Australia called __"The Bonzer" It was designed by a fellow named Aussie Jimand there is also one from the states that was designed by a fellow named Dave Kerzel. (HM1 I think is what he named it. Both of these appear to pretty straight forward with the later engine being the smaller of the two. Sorry I do not have the urls but a short search should generate the required results. There is also the Webster, a bar stock 4 cycle engine. It isn't hit and miss but I believe there is at least one adaptation that adds hit and miss to it. The basic plans are available free online, though not sure about the H&M modifications. The odds and Ends hit miss is a good starter project I think it was my first hit miss engine. My Odds And Ends engine. Many thanks for all the replies, I'll have a good look through the links and maybe treat myself to a set of castings after Christmas. His engines / set of castings have won several awards in the german magazines. His Homepage has a language selector but it looks like the english text has not yet been written. I know Torsten also speaks english - so if you are interested in one of his engines you may just write him and ask about how difficult they are to build. Great link Florian. When I call it up on my phone it automatically comes up in English and quite readable too. Nice looking engines. Torsten is not set up for web payment so it can be a bit involved buying from him with both your and HIS bank charges to add for international transfer. The castings I have had from him have been VERY good. it can be a bit involved buying from him with both your and HIS bank charges to add for international transfer. From the UK, you should be able to do a sepa-transfer (you may need to hurry up though - i don't know what happens after brexit) , it should not be too expensive or complicated. Okay - - well - compared to what actually? Paypal? As I said, international transfer, just like you would pay any other bill using online banking but they put a £15GBP charge onto it as it is international and you probably don't get the best exchange rate either. Cost for SEPA is £19GBP. That is the cost to me, Torsten then gets charged by his bank for accepting that payment so you have to cover that cost too. Torsten is not set up for any online payment be that by card or Paypal and will send you an invoice on receipt of order with his bank details, upto you to find a way to get the money there. I expect it is easier for German customers and maybe other countries that use the Euro.